World War II marked the biggest philosophical overhaul this sport is ever likely to see. It was the moment that Americans truly began perceiving dogs in human terms. They were beloved family members capable of unimaginable heroics. They started to get some respect. And more pertinent to this deal, AKC suddenly started getting some respect. Purebreds accounted for a tiny fraction of America’s dog population at the start of the war. No one, especially AKC, was blind to the fact that it was creating an incalculable market for their product. Their overblown editorials made it clear that they were poised to cash in on this national dog euphoria. Many breed clubs began reaping the rewards long before the war ended. Even those not re- motely connected to the war effort capitalized on the opportunity. The Great Pyrenees, as noted, watched those heroics from the sidelines. Francis and Mary Crane deserve credit for persevering in the face of this epic humiliation–and that got harder by the minute. Naturally, everyone was keen to pass the buck. AKC’s ire triggered an overdue review of their breed acceptance policy, which up to then basically amounted to no policy at all. Their default response was ‘No’. Otherwise, it depended on the ever-changing whims of the board. If and when that door opened for a new breed, the evaluation process, loose as it was, was applied rather inconsistently. When the Great Pyrenees was admitted in February 1933, it didn’t even come close to those vague guidelines. A slapdash verbatim translation of the 1927 French standard was quickly approved. There was no club, only one established breeding program, and a total of two fanciers. Nor was this a particularly standout case. 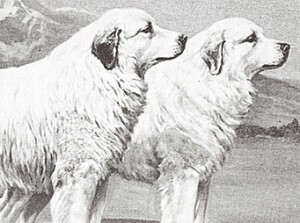 By then, the AKC stud- book reflected decades of truly bizarre decision making. AKC’s approach demonstrated considerable evolution in thinking in the coming years, but their immediate reaction, promoted by both anticipation of the coming bull market and a characteristic desire to distance themselves from a situation of their own making, was to issue a ultimatum in the July 1943 Gazette. Posted by Alex on Nov 29 2018. Filed under Current Articles, Featured. You can follow any responses to this entry through the RSS 2.0. Both comments and pings are currently closed.